Will Chavez Jr. be the next fighter to dump Roach? By Robert Jackson: Over this past weekend Amir Khan announced his exit from the Freddie Roach camp and entrance into the Virgil Hunter camp. Under Hunter – as it was under Roach, Khan won’t be the 1st option, Andre Ward WILL be. Mike Dallas Jr is also trained by Hunter, just winning his 2nd fight with Hunter in his corner. I for one think that this move is a good one for the simple fact that Hunter isn’t loaded down with a large stable of fighters to cater too, like Roach and Emanuel Steward (but that could change with the success of Ward and Dallas). Khan will get a lot of Hunter’s time to develop his technique and tactics in pursuit of championship. If Khan chooses to listen and not talk so much, his improvement WILL be evident right away. Another Freddie Roach pupil lost big time this past Saturday night but had a chance to pull it out in the last round but didn’t. Severely outfought and out-boxed for 10+ rounds of the fight, it looked like Chavez Jr wasn’t TOTALLY prepared for what he would be facing. 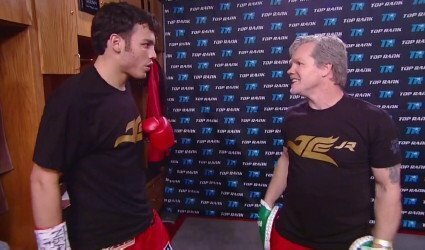 All of the pre-fight talk coming out of Chavez Jr’s camp sounded like Chavez Jr would be ready, and when he easily made weight that gave most observers every reason to believe that Chavez Jr was indeed ready. Roach also said pre-fight he didn’t think that Martinez was that good of a fighter, and after the fight…Roach said he didn’t know that Martinez was that fast. Could it be that Chavez Jr spent most of his time in camp losing weight?? Don’t be surprised if Team Chavez Jr and Chavez Sr make a change, pulling Chavez Jr out of the Roach camp and point him in Emanuel Steward’s or Nacho Beristain’s direction. As Chavez Jr’s career moves forwards he’s going to have to develop the skills necessary to fight ALL styles of fighting, especially if he moves up in weight and is forced to face the elite of the 168lb and/or 175lb divisions. Chavez Jr will require a no-nonsense coach capable of instilling discipline and consistency into his preparation for the BIG fights that lay ahead of him if he’s going to have any chance of winning. You are here: Home / Boxing News / Will Chavez Jr. be the next fighter to dump Roach?